Whether your timber garage is used to house your car, or as a storage solution for outdoor/garden equipment and belongings that don’t have a place within the home, our Maidstone garage is built from premium-quality timber. Our expertly-crafted, outdoor timber buildings offer a plethora of space to store everything you need. What’s more, our Maidstone garage is fully customisable meaning you can choose your door and window position, specified cladding and window type, for example. Get prepared the arrival of your new timber garage by installing an appropriate base for the building to sit on - explore our guide to building a shed base here. Our timber buildings have been built with expert craftsmanship and high-quality 100% pressure-treated wood; our single-story garage maintains a pristine appearance and durability for years to come, whilst offering a secure location for cars and outdoor/indoor equipment. 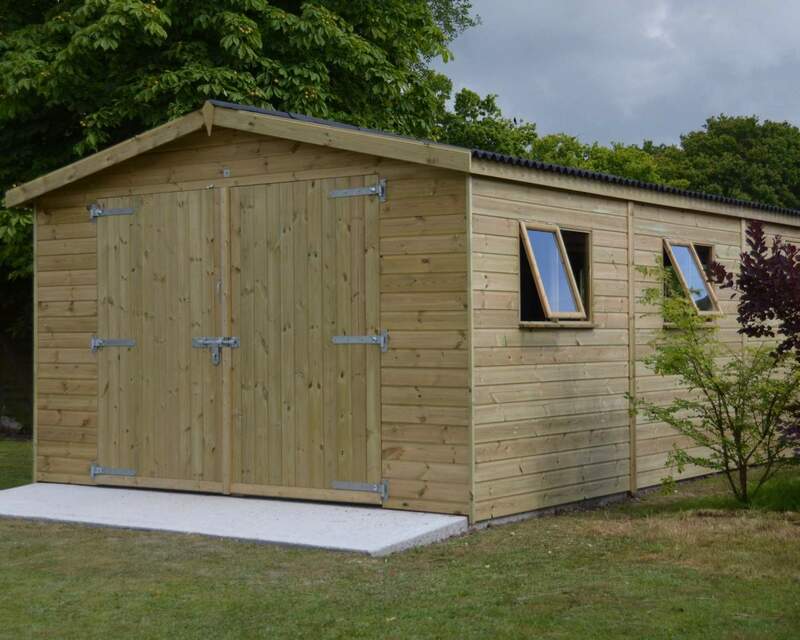 Our wooden garage has been designed without a floor for direct application to a secure base, to ensure its suitability for use as a workshop or storage unit – the great thing about our garage is you can tailor the area to your needs. We build our timber garage with heavy-duty framing throughout, to ensure your outdoor building is substantial and strong, regardless of exposure to harsh weather conditions. The garage also features a double joinery door, offering easy access for storing both a car and/or personal equipment. What’s more, you can be rest assured the roof of your garage will remain protected with a high-quality, green mineral felt, immediately mitigating the problems of weathering. We offer garages that can be fully customised in terms of their width and length. We offer fully customisable widths and lengths of our wooden garages to ensure you find the perfect fit for your desired area. Customers are also able to add extras including cladding, bespoke doors, window options, felt, security applications, treatment methods, installation, easy-access apex, integral log end storage and roof window. At Ace Sheds, we offer FREE delivery & installation in Kent, London, the rest of the South East and selected postcodes in the South – check our delivery page to see if you qualify for free delivery. If you’re located outside of the South East, please do not hesitate to get in touch; we may be able to deliver and install your timber building for an additional fee. If you would like to talk to a member of staff about your wooden garage then call us today on 01233 822042 or Contact Us online. If you’ve found what you’re looking for online, purchase your wooden garage today!